Cornelius found a small grocer near the library where he works that sells bottles of pop shoppe pop (an old beloved soda company from my childhood). We downed the pop (mmmm, black cherry!) 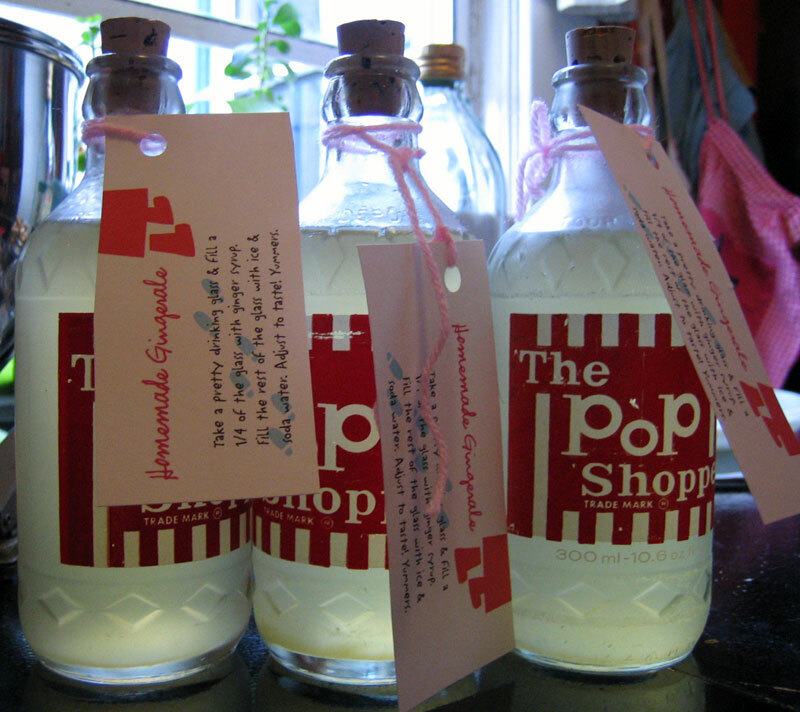 and I decided to fill up the bottles with something of my own making. So part of my Christmas giving included bottles of ginger syrup. I made some labels with directions on how to make your own tasty gingerale or ginger beer and found the very necessary corks to stop the bottles. Yummers! ps. Love the photo? It’s taken with my very new digital camera, a Canon Powershot SD300! Cornelius gave me the best Christmas gift ever. Actually, I say that every year. Combine water and sugar in a saucepan and stir until sugar dissolves. Add ginger, lemon juice, rind, cardamon, salt & pepper. Bring to boil over high heat, then reduce heat to low and simmer for 40 minutes. Remove from heat, cover, and let steep overnight. Strain and chill. To serve, add 1/4 cup of syrup to a pretty glass and top with soda water and ice. It should keep for about a month in the fridge. Sounds delicious! I love gingerale. And a new camera to boot! Sounds like you had a very Merry holiday! Thanks Michele, it was a very merry holiday! I had some friends try it and it’s more like gingerbeer than gingerale, so you can cut down on the ginger i guess to get more of a gingerale taste. No problem Rachel, thanks for the reminder! Me too, Tania! It’s totally a childhood reminder. I grew up in London, ON and there was a bottling plant & we’d pick up our pops from there. I was so surprised when Cornelius brought some home! The bottles are super cute. Ooooh, a new camera! We’re actually shopping for one now, and they’re so hard to choose from. How do you like yours? Found you through our site stats–thanks for making us one of the few music blogs you link to! Your blog is fabulous. I keep thinking once I get tired of writing about music, I may have to do a food thing. I’m printing the chocolate mint and button cookie recipes and am also eyeing that chicken stew…I’ve added you to our general blog roll and plan to stop by often! Congrats on the camera! Looks like you are getting a good start with it! Crystal and Joe, I love my camera! I’m definitely going to get lots of use out of it! I really enjoy your blog and admire your culinary creativity! Thanks for sharing all these yummy recipes. I stumbled across your blog when I was looking for a cookie recipe to match Caper’s breakfast cookie – and you had the winning recipe. I’m going to make this ginger syrup with Stevia instead of sugar to soothe my crazed ginger ale cravings. All the best… I hope you’re enjoying our Vancouver winter wonderland. i remember the pop shoppe too– it's hazy– in Ontario? Ste-Catherines maybe? I know this is an older subject, but still very useful, but I was wondering did you mean to add salt and pepper to your recipe? Hi Bernadene, yes, I add the salt & pepper. The salt tames the sweetness and the pepper ups the spiciness – but you could leave them both out.